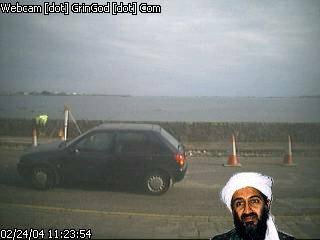 GrinGod [dot] Com » Osama Bin Laden – Alive and Well!!! Osama Bin Laden has finally been spotted alive and well. Following the invasion of Afghanistan the where-abouts of Bin Laden have been unknown to the Western Powers that be. It is now under stood that he fled Afghanistan sometime prior to the invasion and, using his wealth and powerful contacts, made his way through Russia and into Europe. Anonymous sources have notified me that Bin Laden may have made contact with a Mr Roger Berry and, knowing his liking for money, made a deal to come to Guernsey. What is most supprising is not the fact that Osama Bin Laden is in Guernsey but that the UK has made it clear that it believes that Guernsey is a “soft spot” in terms of illegal immegration, so why didn’t they bother to look here first?!?! ?